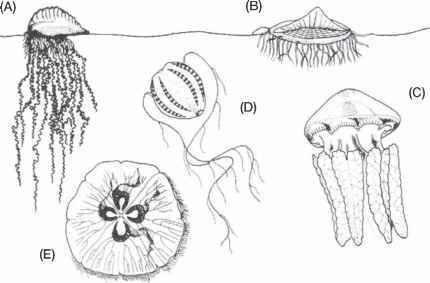 These are colonial anthozoans in which the polyps occur on the outside of an axial skeleton of hard, black, proteinaceous material that bears tiny thorn-like projections (Fig. 19.81). The polyps are non-retractile and bear only six tentacles. Two main colonial structures occur: single whip-like forms that may be coiled but do not branch (genus Cirripathes), and bushy forms, in which a thick central trunk divides into increasingly smaller branches and eventually very thin branchlets (genus Antipathes). While Cirripathes are common on the GBR, the large tree-like forms mostly occur out of scuba diving range. There is a long history of exploitation of black coral skeleton for jewellery. Colonies large enough to have formed the desired dense, shiny black skeleton at their bases are believed to be very old and usually occur far deeper than 20 m: these are sometimes found on Australian beaches after heavy weather. All international trade in black coral, even in the form of the final product, is subject to regulation under the Convention for International Trade in Endangered Species (CITES).